Research into the effectiveness of pumice as a natural, economical concrete pozzolan was conducted from 2012 to 2014 by the University of Utah (2 phases) and the University of Texas-Austin (on behalf of the Texas DOT). This research tested and quantified the performance of eight commercially available natural pozzolans. What is presented here (and in the downloadable summary) focuses on the results delivered by the pumice used in the study, sourced from Hess Pumice Products of Malad City Idaho and commercially available as Hess Standard Pozz (DS325). NOTE: The research information abstracted below is significantly expanded upon (with graphs) in the six-page PDF document entitled "Summary of Research on Pumice Pozzolan by the University of Utah and the University of Texas-Austin." Summaries and full original reports for each research study are also available from the site's download page. UNIVERSITY OF UTAH: Hess Pumice Natural Pozzolans reduced the heat of hydration anywhere from 10 - 40% during the first 100 hours, depending on the ultimate mix design, thus lowering the threat of thermal cracking and allowing for a cooler, controlled set. Nevertheless, without reducing the w/c ratio, there is sufficient early strength gain to be useful in almost any concrete application, especially if the UltraPozz is used. After 100 hours the cement-water hydration process wanes while the pumice pozzolan mixes continue to hydrate until one of the two remaining hydration agents, Calcium Hydroxide or Pumice Pozzolan, have been consumed. This slow pozzolanic hydration process can continue for months and even years, bringing the long-terms strength of the pumice based concrete well beyond the OPC control. 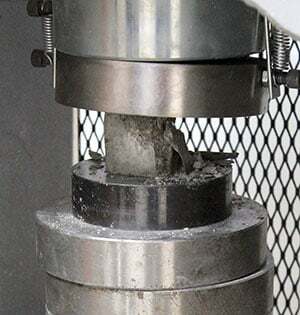 Long-term compressive strength tests were not conducted by the University of Utah, however, previous tests indicate that the eventual compressive strength of the pumice pozzolan mixes will exceed the control by 15-40% depending on mix design. UNIVERSITY OF TEXAS: Similar to Class F fly ash, pumice pozz lowered the amount of heat evolved during hydration, which makes it suitable for concrete applications where thermal cracking is a potential issue. Furthermore, the plots did not show an increase in the length of the induction period (i.e., the time to the acceleratory phase of cement hydration), which indicates that it does not have an adverse effect on cement hydration. UNIVERSITY OF UTAH: Pumice pozzolan based mix designs remain very workable and set times are not significantly longer than the 100% cement control. The various pozzolan mix designs had an extended set time versus the control of anywhere from 44 minutes up to a maximum of 81 minutes. This is directly related to the lowered and extended Heat of Hydration function provided by the pumice pozzolan and higher water-to-cement ratios due to the increased water demand of the pozzolan. If a quicker set and high early strength are desired, the use of a water reducing agent will offset these properties. Pumice pozzolan based concretes can be ‘engineered’, with the use of a HRWR, to produce high-performance, high-strength concretes without compromising the amazing chemical resistance properties outlined in the U of U study. UNIVERSITY OF TEXAS: At 15% of cement replacement, pumice samples reached initial set in 3.6 hours (3.4 for OPC control) and final set in 5.0 hours (4.5 for control). At 25% replacement, times were pushed out to 3.8 initial set and 5.3 final. By way of comparison, 15% fly ash replacement mix designs reached initial set in 3.5 hours and final set in 4.9 hours. UNIVERSITY OF UTAH: In the Phase 1 Study, a relatively high water/cement ratio of .485/1 was used for the control and 4 additional mix designs utilizing the pumice pozzolan. (Note: This is a worst-case scenario…the properties and strength only get better as the w/c ratio goes down.) The four pumice pozzolan mix designs ranged from 3300 PSI to 4600 PSI in 7 days and from 4800 PSI to 7000 PSI in 28 days. Pozzolan quantity and particle size accounted for the variation in strengths. These factors are consistent and predictable, pour after pour. All of the pozzolanic qualities can be enhanced and compressive strengths can be boosted generously with the addition of an HRWR to lower the water to cement ratio. UNIVERSITY OF TEXAS: The pumice pozzolan concrete mixture gained strength slowly at first, reaching 95% of the control strength at 90 days with a 15% replacement and 99% of the control strength with 25% replacement. This is similar to the trend seen during the mortar studies. It should be noted that although the pumice SCM specimens gained strength slower than the control and the Class F fly ash specimens, at 28 days scored strengths greater than 4500 psi. UNIVERSITY OF TEXAS: The yellow dots in the graph represent the “ACI 201: Guide to Durability” limits of Class 1, Class 2 and Class 3 sulfate exposure. An SCM qualifies for a Class 1 mild sulfate exposure if it can keep expansions below 0.1% for 6 months, when tested for sulfate attack using ASTM C 1012. Similarly, an SCM qualifies for a Class 2 moderate sulfate exposure at expansions below 0.1% for 12 months. Finally, a Class 3 severe sulfate exposure requires the SCM to keep expansions below 0.1% for 18 months. The pumice pozzolan concrete qualifies for use in a Class 3 Severe Sulfate Exposure Environment at both 15% and 25% replacement levels. UNIVERSITY OF UTAH: Chloride penetration resistance is a key factor in protecting reinforcing steel embedded in the concrete from corrosion and ultimately protecting the concrete from failure caused by expansion of the iron oxide hydrate (rust). The 4 pumice pozzolan mix designs increased resistivity anywhere from a minimum of 214% of control to nearly 500% for the Hess UltraPozz. UNIVERSITY OF TEXAS: There are no well-established paste and mortar tests for this measurement, but this durability property is crucial, as the ingress of chloride ions can depassivate the steel in concrete and cause corrosion, without needing a drop in the pH content. At 32 weeks, the pumice-concrete samples had less than 500 coulombs of total charge passing through them when tested, which indicates very low chloride ion penetrability, according to ASTM C 1202. The overall results also indicate that increasing the pumice SCM content also increased the resistance to chloride ion penetrability. UNIVERSITY OF UTAH: The graph below tells the story better than words. Using the same expansive aggregate in each mix design, the control with 100% OPC quickly fell into the ‘deleterious’ category while the pumice pozzolan-based cements were clearly resistant to the ravages of ASR. UNIVERSITY OF TEXAS: The pumice SCM concrete mixture performed very well, and kept expansions below the 0.04% limit of ASTM C 1293, validating the results found from the ASTM C 1567 Accelerated Mortar Bar Test for ASR. The table right lists the average expansion of the concrete prisms at 24 months, along with the range of the data. UNIVERSITY OF TEXAS: The CoTE value was measured according to the TxDOT procedures of Tex-428-A. CoTE measurement is another test that was not performed during the paste and mortar phase of the project. However, it is an important durability property to know, especially when considering the performance of concrete pavements, as concrete with a high CoTE can cause early age cracking and joint spalling. In continuously reinforced concrete pavements, a high CoTE value of the concrete may increase the crack spacing and width, affecting the crack load transfer efficiency. Although CoTE is primarily dominated by the aggregate type and source, the SCM type and content could also have smaller effects on the value. As such, these experiments were conducted to ensure that the pozzolans did not have any detrimental effects on the CoTE value of concrete. The pumice SCM specimen (Hess Standard Pozz) tested for CoTE showed compliance with Tex-428-A. The difference in CoTE values between the control specimen and the pumice SCM-concrete specimen was small, indicating that the use of pumice as an SCM would not cause any detrimental effects to the CoTE value of concrete. 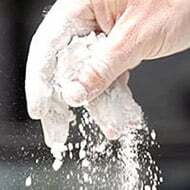 UNIVERSITY OF TEXAS: The drying shrinkage of the concrete bars was measured according to the procedures of ASTM C 157. The pumice SCM concrete mixture had negligible differences in shrinkage compared to the control when used at a replacement dosage of 15%. However, the amount of shrinkage increased to more than 0.010% of the control as the replacement dosage was increased to 25%. Hess Pumice Natural Pozzolans are white in color (scoring a GE brightness of 84) making HessPozz the choice for use in any concrete where a lighter color is important for decorative or architectural reasons. Safe, white, easy to use, natural pumice pozzolan produced and perfected by Mother Nature and processed by Hess Companies is available world-wide for use in any concrete mix design where outstanding chemical resistance and unmatched durability are desired. Need more proof? 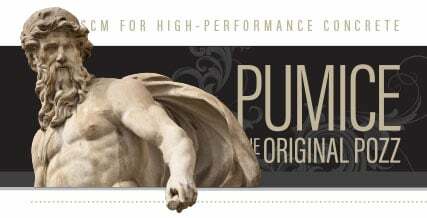 Look to Rome, where 2000 year old monuments of pumice pozzolan’s excellence are on display for all to see. What was old is new again. We ship these pozzolans around the world where discerning customers insist on the original (and still the best): Pumice Natural Pozzolan. Request a testing sample (below). Welcome to consistent performance, stable supply, and superior concrete. Concrete using HessPozz as an SCM reaches 95% of control strength in 90 days. It then continues to gain strength, surpassing control strength and density as additional C-S-H binder is formed as the pumice pozzolan is further consumed. 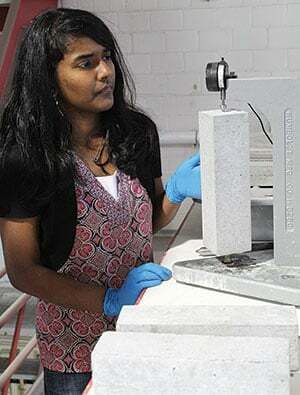 Testing shrinkage in concrete bars at the University of Utah concrete materials research lab.